So where can we go next time? The guide Giovanni was excellent, young and ambitious, interesting and interested (could have perhaps given us more history), and only wanted to please us and accommodate all our wishes. Ditto the delightful guide, Jorge, an older man, a great driver and wonderful personality they made a great duet. One always takes risks since we did not know each other, and were to spend a lot of time together, but it turned out perfectly. I am so glad that we decided to concentrate on Ecuador. What a wonderful country, we loved exploring all the different areas. Now to my comments per establishment, in italics. Flight to Quito, Iberia 66351. Smooth meet and greet at the airport by Giovanni, Jorge was waiting by the jeep terrific vehicle, very trustworthy and comfortable. Marcela from Toppsa was in contact touch. 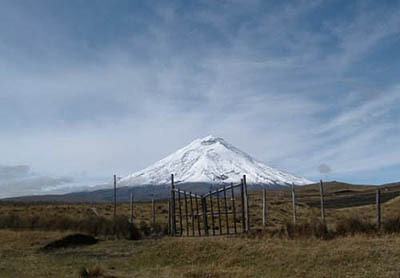 Hacienda La Carriona Vía Sangolqui, Amaguaña Km 2.5, Sangolqui, Ecuador. Looked wonderful but there were problems the room was freezing, we asked them to light the fire, there was no hot water NOT what we needed after a long flight. We were the only guests so it was rather quiet and the owner's daughter was not particularly friendly; the food was fine. I think in retrospect a dependable place would have been better. 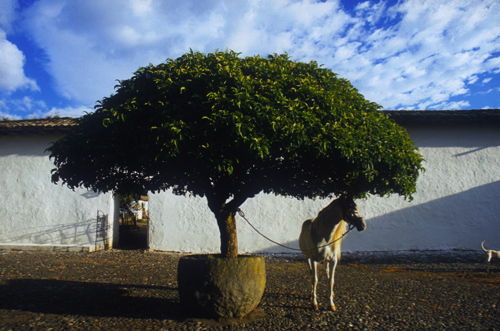 Overnight in the Hacienda San Agustín de Callo. The second night there was a management change (the last one was only there for ten days, what a shame! No hors d'oeuvres, and tiny rations of food! Albeit the Inca dining room is spectacular, as was the view of Cotopaxi in the morning. We hiked there in the day -- quite an experience -- Giovanni constantly making sure we were OK altitude wise. 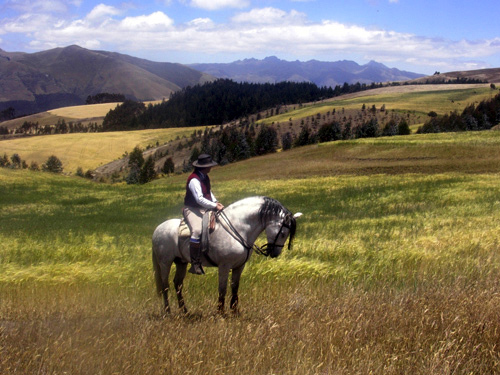 Hacienda Zuleta, Zuleta Valley, between Ibarra and Cayambe, Ecuador. Superb, unbelievable place. Nice room (not that big, the nicest room was the éscritos or something); the hiking was spectacular: the condors, the black bears, the views, meeting with locals, milking a cow, visiting the cheese factory, going around the house with Fernando quite unreal hospitality. Met with all the family walking on the Sunday. Got really muddy and I liked the way that Giovanni and Jorche insisted on washing our rubber boots before we got back to the hacienda very considerate. The dining room could have had more atmosphere I suggested candles.. lovely food, nicely served but the girls only started to smile once we started talking to them. The next night it was Superbowl and some guests wanted to see their hometeam so they arranged for them to watch the game bistro style in the activity room. The other 4 guests had supper by the fireplace -- a real case of doing what the customer wants. 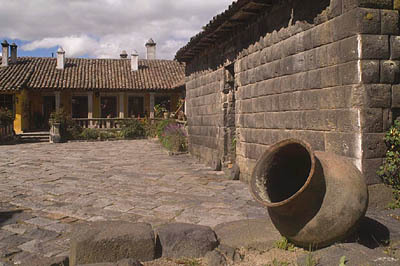 Hacienda Zuleta. We had been to Otavolo (great fun) but we went to a local market in Zuleta and with Giovanni's help (our Spanish is not bad, but this was complicated), we ordered a handmade embroidered tablecloth for our table here from one of the local ladies -- more of this later. 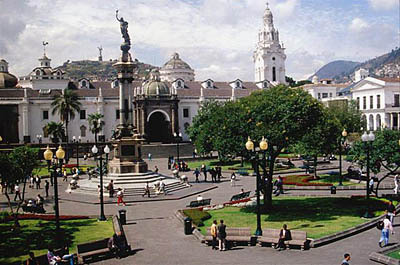 Quito, Villa Colonna Bed & Breakfast. Now this is a real gem! Only mistake that Giovanni and Jorche made is that they had not checked out where it was before, so we went round the town a bit -- it is very discreetly located. Glorious place, incredibly comfortable suite, wonderful linens, coming back from dinner (more later) it was illuminated by candles gorgeous. The breakfast was to die for. This is the only place to stay in Quito! The dinner that we had at Blu was interesting since it was such a modern hotel (we had a look at some of the rooms) but again, we were the only people and it was very slow service, the food was well presented and tasty. The maitre d' was excellent. But, felt too much of a tourist, would have preferred a local establishment. Intra-tour flight Quito - Coca, 11:30 am - 12:00 pm, VIP 2605, Charter flight Giovanni made sure that we got on the flight ok, most impressed by the service of VIP. 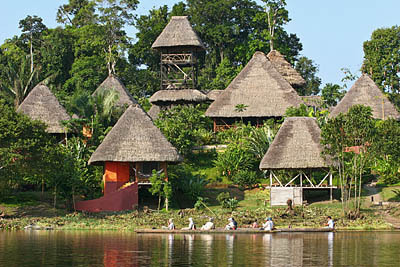 Napo Wildlife Center A marvellous experience, not for the faint-hearted! It is quite an active trip, which we love. We even went out at night with only torches for company into the forest... I had a shamanic healing at the community centre, which was weird but felt good; I was amazed by the quality of the cabanas, the food, the excursions, everything was great. Highly recommended. Heading out to explore the lake on a bright sunny morning. Flight Coca - Quito, 12:20 pm - 12:50 pm, VIP 6205, Charter flight. Giovanni was there to meet us, we went back to the hotel for a freshen up and then, since we were going on a city tour the next day with the cruise, instead he took us to where we wanted to go to the Olga Fisch Gallery (marvellous), to buy decent binoculars and a long-sleeved shirt for Galapagos, and to have a decent coffee in a coffeebar -- fun to be in the lively Mariscal district. Unfortunately, our last meal was a great disappointment. We wanted an authentic local good restaurant, but instead the Belle Epoque turned out to be a real tourist clip joint. Elli ordered a Black Label whiskey, they gave him a Blue label and charged -- I am not kidding -- $50 FIFTY dollars. I was furious but Elli did not want to argue with them. I sincerely advise you never to use this place again. After our return from the Galapagos, we were thrilled to find that Giovanni had indeed made sure that our tablecloth arrived safe and sound and delivered to us just before we left home -- a good memory of a wonderful trip. I was extremely happy with the service and attention which you gave me, and that of Giovanni and Jorge, backed up by Marcela whom we did not meet, but she was on the phone checking up. I already have a friend to whom I have recommended you to, and I hope he will be in touch with you.